The Bureau of Labor Statistics released its August 2017 summary of job openings and labor turnover earlier today. 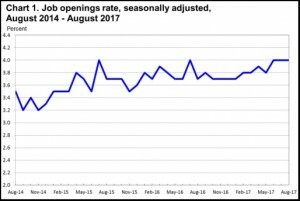 As at August 31st, there were 6.1 million job openings. According to the Bureau of Labor Statistics, the job openings rate was 4% in August, while the number of job openings was little changed for total private and government. The sectors which recorded increased openings in August were in health care and social assistance (+71,000) and durable goods manufacturing (+31,000). Decreased openings were witnessed in other services (-95,000), educational services (-51,000), and nondurable goods manufacturing (-48,000). The number of job openings increased in the Midwest region. According to the Bureau of Labor Statistics, “Total separations includes quits, layoffs and discharges, and other separations. Total separations is referred to as turnover. Quits are generally voluntary separations initiated by the employee. Therefore, the quits rate can serve as a measure of workers’ willingness or ability to leave jobs. Layoffs and discharges are involuntary separations initiated by the employer. 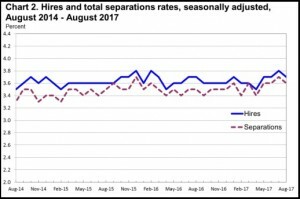 Other separations includes separations due to retirement, death, disability, and transfers to other locations of the same firm.” Total separations in August was ‘little changed’ at 5.2 million, while the separation rate was 3.6%. total separation showed little change for total private and for government as well as all industries. Total quits for August was 3.1 million with a rate of 2.1%. The number of quits was little changed for total private and for government. Quits declined in information (-14,000) and mining and logging (-6,000). In the regions, the number of quits rose in the West but decreased in the South. (See table 4.) There were 1.7 million layoffs and discharges in August, little changed from July.